Despite a rally in global markets, the Indian bourses fell on Monday as cross-border tension between India and Pakistan dampened investor sentiment. The benchmark Sensex ended with losses for an eight straight trading session—its longest losing streak since August 2013. The strike on India’s paramilitary forces last week prompted investors to assess the economic and geopolitical repercussions. The Sensex ended 310 points, or 0.87 per cent lower at 35,498.44, while the Nifty 50 index fell 0.8 per cent, or 83 points, to 10,641. The India VIX index, an indicator of market volatility, surged 9.4 per cent—most in nearly two months. Most Asian markets headed north following encouraging economic data from China and optimism that trade talks between the US and China would yield positive results. “Indian markets fell even as global bourses gained. Typically, gains in global markets rub onto Indian markets as well. Asian markets gained on Monday on the back of positive developments in China trade talks. The selling spree back home has continued, amid foreign outflows, as escalation of tensions at the border has impacted sentiment,” said Vinod Nair, head of research, Geojit Financial Services. “Volatility in the market will continue due to lack of domestic triggers and investors are likely to remain cautious. Global market stands positive, supported by hope of US-China trade deals,” he added. Foreign portfolio investors (FPIs) pulled out Rs 1,240 crore from domestic stocks, while domestic investors bought shares worth Rs 2,336 crore. Barring two, all the sectoral indexes ended the session with losses. China’s Shanghai Composite index gained nearly three per cent, while Hong Kong and Japan rose nearly two per cent each. Trade talks between the US and China are set to resume in Washington this week. Last week, representatives of both countries met in Beijing. US President Donald Trump on Friday said that Washington was closer than ever before to having a “real trade deal” with China. Meanwhile, the benchmark Sensex shed nearly 1,500 points, or four per cent, after eight days of losses. Many shares in the broader market have tumbled this month amid concerns over rising debt, liquidation of pledged shares and weak corporate earnings. 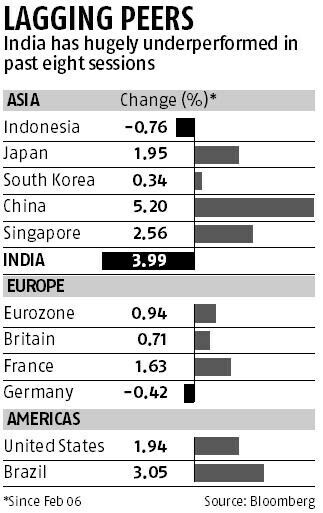 The Indian market has under performed most major global markets this month. 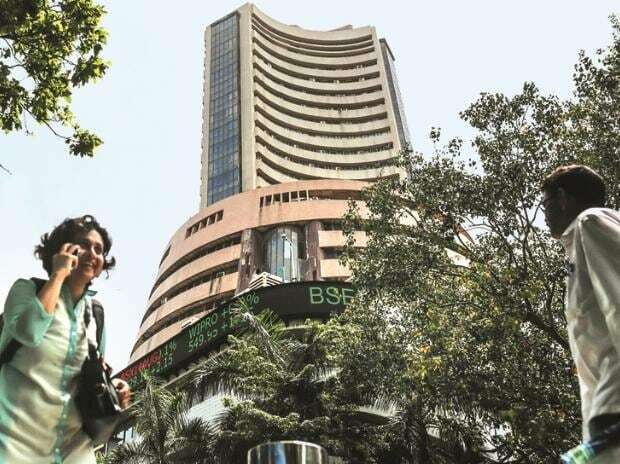 Since February 6, the Indian markets have declined four per cent even as most Asian, European and US markets have made positive strides following pause in interest rate increase by the US Federal Reserve. Back home, an unexpected cut in policy rates by the Reserve Bank of India (RBI) failed to lift the fortune of domestic stocks. Market participants said investors will keenly eye developments at the border, government action and outcome of the US-China trade talks. “Military escalation along the border with Pakistan will have a negative sentimental impact on the markets. It needs to be seen if the government changes its focus now and cuts down on doles to boost consumer spend,” Abhimanyu Sofat, head of research, IIFL Securities told Bloomberg.